We would like to congratulate Director of Travel Sylvia Weg-Swezy on becoming a HealthTrust Hero! Sylvia’s selfless actions to help the Finance team in an urgent and timely manner earned her a spot among our workforce elite. Sylvia joined HealthTrust Workforce Solutions six years ago as the Director of Recruitment for Perm Placement for our East Florida Staffing Division. A year later, she joined the Travel team as one of their two directors. In her current role, she is responsible for managing a team of 50 Travel Recruiters and Associate Recruiters in the Sunrise, Dallas, Nashville and Denver offices alongside Director of Travel Recruitment Joi Crockett. In the summer of 2018, Sylvia was asked to help the Finance team as Interim Leader and she dove right in without hesitation. Sylvia spent three months with the team, where she learned the ins-and-outs of billing and processes on the vendor side, and she helped streamline processes to better accommodate both the vendors and the Billing department. In this role, she had the opportunity to work closely with VP of Shared Services Wendy Ann Wedeking and CFO Jennifer Chemtov. Sylvia took the time to dig deep and to not only get to know the team, but hear them out when it came to processes and procedures. 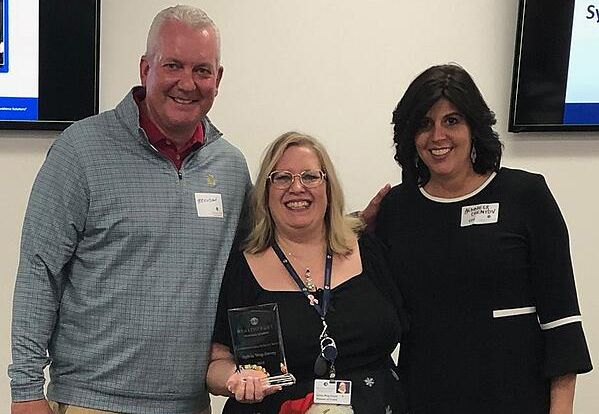 She also built relationships with members of each of the teams that make up the Finance department such as Billing, Shared Services, Accounts Payable and Accounts Receivable. By doing this, Sylvia was able to help guide each team as they smoothly transitioned into new and improved developments for their daily tasks. Join us in congratulating Sylvia Weg-Swezy on becoming a HealthTrust Hero. Sylvia is pictured above (center) with President & CEO Brendan Courtney (left) and CFO Jennifer Chemtov (right). If you're interested in joining our team, click here to view our job opportunities. Engage is an emerging blog which features relevant, informative and engaging content designed to promote and advance the healthcare industry and the professionals who work within it.